It is disingenuous to request people to Like or Tweet something before they’ve had a chance to actually experience it. This is a perversion of social media. I recently clicked on a band ad that intrigued me on Facebook. I’ve given Facebook enough info about myself that the algorithm can somewhat determine I like music of a particular sort. Sure, I do miss the music of the 80s (who doesn’t?). 22k fans. Not bad. So I get to their Facebook page eager to check out these sounds. They’ve got a big audio player on the page. Great. I click the play button. Instead of sweet synth pulses I get a little popout that requests I ‘Like’ the song (or band, I can barely tell) so I can listen to it. ‘Like’ the track before I listen to it? How could I know I like it? If it’s shlock then I get to broadcast to all my Facebook friends that I’m a complete cheesehead (ignore that I’ve gotten this far). I’m not going to trade my ‘Like’ currency for a speculative listen. That makes no sense. I’m still determined to hear what they sound like. I go clicking to their info to see if they have a website. No website. No Soundcloud. Can’t find a trace of this band on Rdio (which means this is an unsigned band). I only just now realized I could listen to clips on iTunes (which I detest as a music vendor). So I did listen so this post would come full circle. I was going to write a more scathing post but after listening to their music I’ve softened up a bit. I don’t totally blame the band for this bad marketing strategy. I blame Facebook for expecting behavior to conform to their underdeveloped paradigm. In order to hear this track on Facebook I would have to do some marketing for the band. 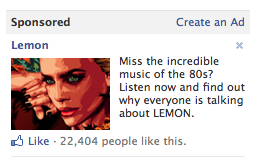 I can only guess that twenty thousand people were not offended that they had to Like a track before listening to it. I don’t see this band’s 20k following as legitimate. They’ve taken a shortcut. The band must think they’re having tremendous success. They bought this ad on Facebook and targeted everyone in the tri-state area that has any 80s music favorites in their profiles. It’s almost too easy. I hate this kind of manipulation. Likes, Tweets and shares are currency. I get that they are asking for something before they give up what they sound like. It’s a transaction. For music, most people prefer to ‘try before they buy’. This could be done in a much more ethical way. 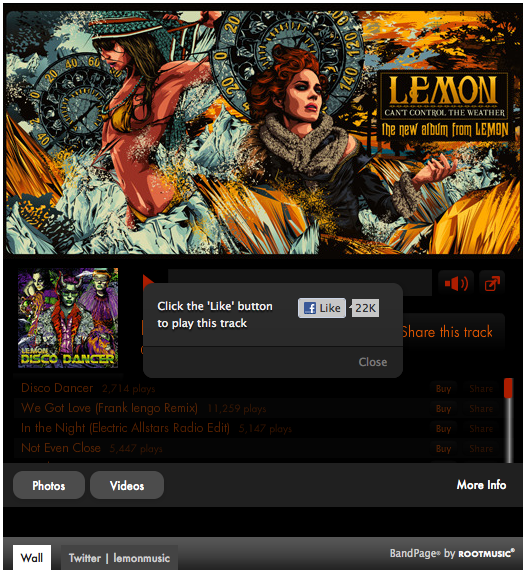 Simply allow me to hear at least two tracks to get to know the music before putting up the ‘Like-wall’. Two tracks is enough for me to to know if I’m a fan. I’m not sure if RootMusic allows those kind of options in the app. Anyway, there’s my rant. It is disingenuous to request people to Like or Tweet something before they’ve had a chance to actually experience it. This is a perversion of social media. I recall that even one of my favorite bands traded a track for a Tweet once. I complied but I felt compromised (dirty?) afterwards and Tweeted as such. No more shortcuts. Let’s keep things real.